The year 2004: TechnoEgyptians now rule the World. They are waiting for the Upcoming New RHA. They are trying to awake the Ancient Atlantis Fathers who give the power to call Him. They imposed a New Uniform to the population of the Earth (the same that Lara is wearing in this level) and are trying to impose their new divinity. But people do hate silently New RHA The Mighty. Why is there NO SKY up above? What happened to the Earth during those years? Where are we? The location is for now SECRET, but it EXISTS and it was NEVER shown in a game before. Don't you believe that here in the Earth there is a place without the sky? 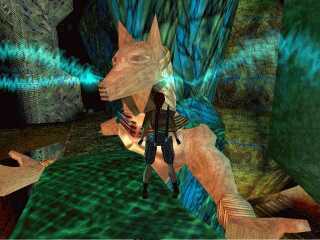 Lara needs all her ability to face the TechnoEgyptians trouble: they are near to call New RHA here in the Earth in the shape of the Warrior of the Death (I'll make this happen in the second or third level, when I will reveal the location). What will happen if someone will open the Portal? Nothing will be the same anymore.